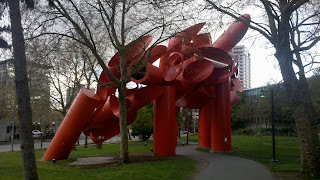 Alexander Liberman's largest sculpture, Olympic Iliad, is a monuental agglomeration of steel cylinders located on the lawn surrounding the Space Needle. Liberman, known for his use of industrially manufactured materials, used giant steel cylinders cut at varying angles and lengths, painted them an industrial red and assembled them to form an immense structure than one can walk around and underneath. 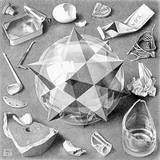 A similar artwork of Liberman's, Iliad, can be found at the Storm King Art Center in Mountainville, New York.